In a June 2012 editorial in a local Piedmont newspaper on the earthquake in Emilia-Romagna, the editor was careful to express his sympathy for the loss of life and injuries. But he was otherwise on another mission: that earthquakes in Italy do more than just knock down old buildings and towers. He explained that when an earthquake destroys a church bell tower or campanile and other historic buildings, it strikes at the very core of local identity and culture. He wrote as if the very survival of Italian culture was contingent upon the immediate reconstruction of damaged buildings, no matter the cost. In the morning, we arrived early in Poggioreale, and everyone was, in fact, up and very busy preparing for the annual Sant’Antonio di Padova feast, scheduled to begin at noon with a procession of the saint. What we discovered was that there are two villages now: Poggioreale nuova and vecchia. Nuova, or the new town, is about five kilometres south of Poggioreale vecchia (old), located on Mount Castellazzo, known locally as Castellaccio, overlooking the Belice Valley in Trapani province. According to local lore, vecchia was built on a site that was originally founded by Trojans fleeing their Athenian conquerors in the aftermath of the Trojan War. Re-established in 1642, the village was part of a feudal zone known as Bagnitelli, which became the property of Marquis Don Francesco Morso. Vecchia’s central square, Piazza Elimo e Matrice, recalls the Greek people who did, in fact, settle western Sicily, the Elimi. In films The Star Maker (1995) and Malèna (2000), Giuseppe Tornatore used vecchia as the setting of villages destroyed by allied bombs. The first quake hit vecchia during the night of January 14, 1968. In my research on the quake, I discovered an obscure field study commissioned in 1968 by the U.S. National Academy of Engineering entitled The Western Sicily Earthquake of 1968. It was written by Robert S. Ayre, professor of civil engineering, and J. Eugene Haas, professor of sociology, both from the University of Colorado. According to Haas/Ayer, that first quake was followed by approximately seventeen more quakes over a period of twenty-three terrifying days. Known as the Terremoto del Belice,the quakes were relatively minor on the Richter magnitude scale, registering between 4.1 to 5.4. 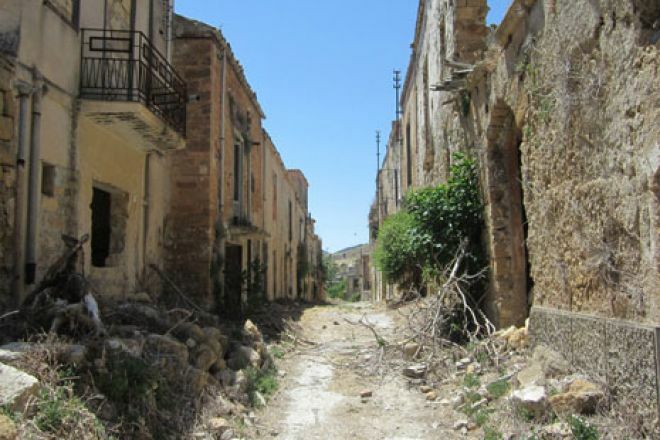 Nevertheless, the series of quakes destroyed three towns, Poggioreale, Gibellina, and Salaparuta, while damaging about eight other nearby villages. Gibellina and Salaparuta were levelled completely. While nearly all of Poggioreale remained standing, none of its buildings was habitable. Given the extent of the destruction, the total death toll for the region was an astonishingly low: 260 people. But it did leave as many as 80,000 people homeless. As Haas/Ayer explained, the Terremoto del Belice was not just a natural disaster, but a human disaster as well. They were justifiably critical of the overall disaster preparedness in the region. 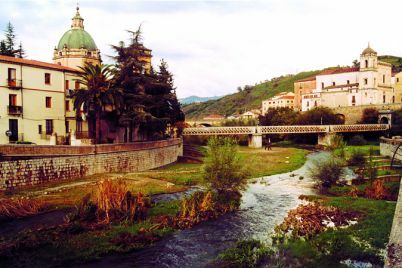 Since the nineteenth century, they explain, Poggioreale and the surrounding region has been a site of mass emigration, mainly to Australia and the U.S. By 1968 the area’s average per capita income was merely $480, less than twenty-five per cent of those living in the Lombardy region. In the wake of the earthquake, Poggioreale’s young men had yet another reason to flee. Though this is one of the world’s major earthquake regions, there was no emergency disaster plan in place. Because of its poverty and low rate of literacy, the region did not have sufficient management level personnel to plan for and then execute disaster relief. In the aftermath of the event, town councils had no money with which to buy supplies for the homeless and injured. As a result, the distribution of what little food and goods arrived was “haphazard,” while “general chaos was the order of the day.” Worse, in the mass exodus from the region, residents clogged roads and highways, blocking emergency vehicles from reaching the stricken villages. Even unscrupulous speculators moved in to buy at hugely discounted rates destitute villagers’ animals. Complaints of profiteering, bribery and “bureaucratic inefficiency” were rife. A year after the event when Haas and Ayer arrived, thousands were still living in tents. In an act of self-protection, if not self-aggrandizement, Rome told the international community not to worry: it had things under control and did not need any help. However, as I tell my students each year as we prepare for our annual January term tour, always expect the unexpected in Italy. Haas/Ayer reported that in a surprisingly rare act of bureaucratic efficiency, within six weeks of the quake, Rome passed the Earthquake Omnibus Act of 1968. It pledged over five hundred million dollars, earmarked to replace all private and public property and to pay losses to families. Rome deferred all taxes and mortgage payments while local governments received a reimbursement for any loss of tax revenues, while all clean-up costs were reimbursed. Of course, in the land of the Mafia, no one can say for sure where all the money went. Nevertheless, over the next decade and a half, Gibellina, Salaparuta, and Poggioreale were rebuilt in new locations and the residents relocated. Web documents informed me that the Poggioreale nuova was designed by Paolo Portoghesi, the renowned professor of architecture at the University of La Sapienza, Rome. With its modern rectangular lines and gray concrete facades, nuova belies its ancient origins. Yet the Poggiorealesi wear their history on their communal sleeve. Upon entering the municipal building that June morning, we were greeted by a woman who immediately asked if we had visited vecchia. Before I could answer, she described it as “bella.” It was a strange moment: that the ruins of such a tragic event could be described as “bella.” What is more, in the main foyer of the municipal building hung a four by six aerial photograph of the ruined village. On the outside wall of the building there was an even larger reproduction of the same photograph. Clearly, the ruined village has become something of a trope, a kind of imaginary “campanile,” a mark of their collective identity as Poggiorealesi. When we arrived at vecchia later that morning, we ignored the sign warning visitors not to enter. When we emerged from a narrow street of ruined buildings, we entered the village’s expansive Piazza Elimo and Matrice. We were greeted immediately by a pack of menacing stray dogs who had every intention of running us out. They seemed to understand my threatening Italian and backed off. That expansive square, which overlooks the Belice Valley below, is an impressive geographical site. No wonder that Poggioreale translates from Latin as Royal Hill. I could imagine the kind of activity that the large square once attracted on those special market and feast days, like the one unfolding in nuova. It is flanked at one end by a destroyed chapel fronted by an expressive, weathered eight-foot baroque statue, the only artefact of any value that remains in the villages. Surprisingly, the streets of the abandoned village were passable. In what turned out to be a prescient thought, I felt the need for some type of signage directing us perhaps to the municipal building or naming the destroyed chapels and churches. I could only wonder which was my grandmother’s apartment. As we walked through the village streets, with the walls of the buildings towering above us, we were wary of entering any of them, though it was possible at times. Because most of the village remained standing, there was always the expectation that we would find an apartment building undamaged, a space that would give us a better idea of what life was once like in the village. A breeze was blowing, and occasionally a shutter banged against a sill. But when we stopped and listened, there was nothing but the silence that engulfed the devastated buildings in their otherwise beautiful and tranquil setting. It was an eerie, ghostly experience that begged to tell us that there was more here than abandoned buildings and feral dogs. At one end of the village, at the site of a ruined barn, we were eyed suspiciously by a herd of goats. What we discovered was that the roofs of nearly every house and barn had come crashing down, including the vaults of the village’s three main baroque churches. According to Hass/Ayers, most structures were constructed out of rubble masonry. To compound their instability, they were cemented with poor quality mortar. Inexplicably, the vast majority of the load-bearing walls of the buildings somehow did not crumble. But the structures’ heavy, tile roofs were supported by flimsy wood rafters, nearly all of which failed during those seventeen quakes. I should have followed the advice I give my students, and prepared for the unexpected. As we approached the Chiesa Matrice (which I identified later) – the oldest church of the village – we saw that its nave was piled high with the rubble from its roof and surrounding walls. However, I was surprised to find that part of the façade and one corner of the church were supported by new masonry buttresses. Furthermore, I discovered that large blocks of its fallen masonry facade were stacked in an orderly fashion to one side along the street. Where there had been no signs of the living in the village, suddenly there was evidence of life. Someone had been there, and from all the evidence, only recently, for the inexplicable purpose of preserving a mere fragment of a hopelessly ruined church. Furthermore, it was clear that thousands of euro in labour and materials had been spent just to shore up this mere fragment of a façade. Then the unexpected occurred again. Only a few minutes later, venturing down Via Garibaldi alone, I found more signs of life. (By then Carole had succumbed to the heat and found some shade). I came upon a large baroque cathedral whose façade was still standing and supported by iron scaffolding anchored in the middle of the street. While the bells in the campanile had been removed, ninety percent of this church remained. Against my better judgment, I stepped lightly into the church’s nave, pointing my camera without focusing and rapidly clicking and then quickly retreating to the street. What I found was that the nave was also filled with iron scaffolding and wood framing anchored by tons of masonry ballast supporting what remained of the frescoed ceiling, the walls, and altar. I was astonished at what we had discovered. But why? What initially appeared to us as a ruined and abandoned village had not, in fact, been forgotten. Later that afternoon back at our B&B, I discovered a web site: Poggioreale Old Town in Sicily: Strategies, Memory, Knowledge and Planning Place, posted by Prof. Rossana Guglielmini, Ph.D., professor of Architecture, from the Department of Projects and Building Construction at the University of Palermo. She and her team of scholars were responsible for the preservation work in vecchia. In her report, she calls the ruined village “one of the most evocative scenes in the whole Belice Valley.” Poggioreale vecchia is now an officially designated “Historic Centre.” The intent is to preserve vecchia as a “study-yard and open-sky laboratory” for its “recovery and re-use” as a “recreational and . . . . public space zone.”The plan is one day to open vecchia to tourists and, more importantly, to scholars to examine what she describes as the “historical, architectonic, economics, and cultural” history of the village and region. In effect, it will become yet another Pompeii, Herculaneum, or Ostia Antica. The people of Poggioreale may well have reinvented themselves within the context of their modern village. But their historic identity resides in that problematic sign “bella:” their sentimental attachment to their heritage, in spite of the suffering caused by the quake. But we must realize that sentimentality is also one of many legitimate avenues into history. It is just not one that scholars can afford to take. In our reconstruction of ourselves, many, even conflicting narratives can and do emerge. What are the multiple avenues that I have taken to my ancestral villages, Bivona and Poggioreale, evident, perhaps, in this essay? This narrative tension has always characterized the history of immigration and migration. As Jerre Mangione wrote in Mount Allegro, no sooner had his relatives arrived in Rochester, New York, having escaped from their historical poverty in Sicily, than they inexplicably began sentimentalizing their past lives in “il bel paese.” To its admirers, the Coliseum is bello, no matter that it is also a sign of the oversized egos of tyrannical emperors who for their entertainment staged horrific slaughters of men and animals in its arena. Bella too are nearby Segesta, Selinunte and the Valle die Tempi, no matter the multiple narratives of dominance and ruin they tell. Likewise, like a palimpsest, the ruins of Poggioreale vecchia recall the full force of its history, from the Elimi people to the Poggiorealesi’s “bella”and the Haas/Ayer narrative in all of its unflattering evaluation of the event. Kenneth Scambray is a regular contributor to Accenti. He teaches literature at the University of La Verne. His published works include Surface Roots: Stories (2004), and Queen Calafia’s Paradise: California and the Italian American Novel (2007). He is the editor of Pasquale Verdicchio: Essays on His Works (forthcoming).